I work with students—who are the future of our community—on a variety of matters, but I also go around and do workshops and training and talk to different groups. We do all sorts of presentations with a focus on intersecting identities. It’s really cool because I get to talk every day about something I’m really excited about and I get to answer questions and be that safe person to ask questions of. So, I always say when I come into a group, “Hey. You know what? I get paid to answer the questions, so I won’t be offended. Ask me instead of somebody else.” And I help create those sort of safe spaces—help people learn how to be allies. It’s a really cool gig. You talk about intersectionality in your new job. Give us a quick primer. Everybody has intersections in their identity: one is your race, one is your gender, another your orientation, and the list goes on. When we talk about intersectionality, we talk about where those things cross over each other. So, this is to say, the experience of a member of the LGBTQ community who is white, cisgender, and American looks very different from somebody where one of those things is different. It’s very different for a member of the community who’s an international student or who is a person of color or is trans. We talk about those intersections where those identities overlap, because the more minoritized identities you have the more it exacerbates the negatives you face. What do you want international students to know? There are issues that are specific to international folks. For example, people might come from countries where it’s illegal to be a member of the community. They can face imprisonment, death—a number of other things. And so, my position is housed in the Intercultural Center in the same place where the Language Center is. It is a safe space for people to come into because others will not know that they’re coming to see me. It makes a lot of sense for international students to be in this space for a lot of reasons, and this is an effort that we’ve made to create a space that is welcoming to a wide variety of people. We have students from other countries who tell us, “It’s really unsafe for me to be out at home, but you know what? It doesn’t matter because I’m here and I can be out here.” So, that’s one thing that I like to let people know—that this is a safe space for all students to come into. Can you talk a bit about your pro bono work to help with transgender name changes? Did your pro bono work serve as a precursor to your work here? I’m really passionate about helping the community. I think it’s important for every member of a community to be contributing and helping each other out. So, with my board work [at the Out Alliance] and also with my pro bono work that was a way that I could help out. What made you leave trademark law? I liked trademark law. It just wasn’t the life that I wanted, and I wasn’t doing something I was really excited about. I took a lot of time to think about what I wanted my life to look like. I had a mentor and friend, a partner at the firm, who said, “You know, you have a very Eastern view of being happy. You don’t think money makes you happy like most Americans do. So, you should do something that really makes you happy.” My partner works at St. John Fisher College. She’s the director of the women and gender studies program over there. I helped out with Campus Out (a program of the Out Alliance to bring together college LGBTQ group e-boards) before I applied for this position. And I said to myself, “You know, I think this is something I’d like to do. I’d like to work with the future of our community. I’d like to work in the advocacy space. I’d like to talk to folks about the issues facing our community, but more broadly, particularly around intersections within our community, which are the folks who often get lost.” I saw this position come up and thought it sounded like my dream job. So, I decided to take a risk and try it. And I was absolutely right. It’s totally my dream job. I get excited every day waking up and doing this. I get excited about putting together workshops. I get excited about working with the students. 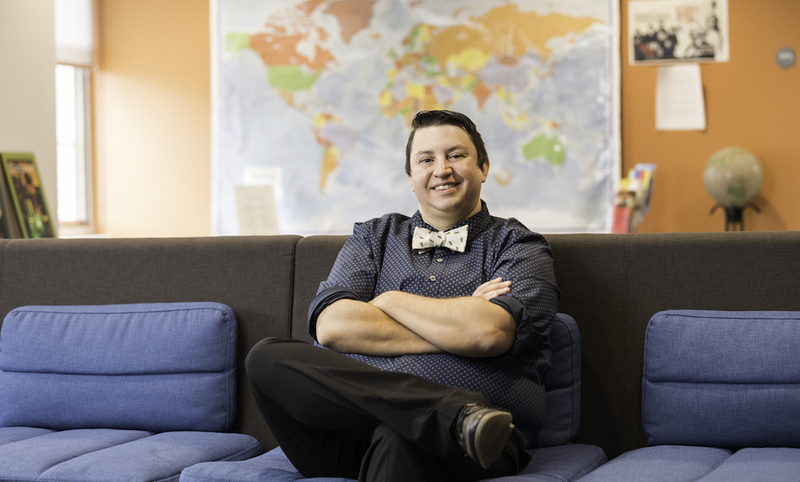 Does being the LGBTQ coordinator allow you to really be who you are? The environment at the law firm was inclusive. I was able to wear my bow tie and wear men’s clothing because I have a male gender presentation and they were accepting of that. That said, you had to be cautious about how much you talked about issues in the community because there were clients around and that can get a little murky. But here if I show up in a bow tie, people are like, “Yes, this is the person we hired.” And it’s good, because I show that there are differences. There can be gender identity and expression differences. I identify as a woman, but my gender presentation is male. And that’s really helpful when you’re an LGBTQ coordinator because people can see things and ask me questions, and I can answer them.